Duke Moscrip, owner of Duke's Chowder House, was the featured speaker at the Long Live the Kings’ 30th Anniversary Spring Fling benefit dinner. Duke delivered a rousing keynote speech to encourage action and recovery of endangered wild salmon and steelhead. We need to do everything we can to restore that population. I want to make sure that our grandchildren and our grandchildren’s grandchildren will have plenty of wild salmon forevermore. On April 28, 2016, Long Live the Kings (LLTK), a nonprofit committed recovering wild salmon and steelhead and sustainable fishing, hosted its Spring Fling fundraiser. The benefit took place in a fitting location—the Seattle Aquarium—to honor a momentous 30-year legacy of wild salmon restoration efforts. A notable attendee of this event was Duke Moscrip, Owner of Duke’s Chowder House, avid sustainability advocate, and featured speaker. Part of the Salish Sea ecosystem, both Long Live the Kings and Duke’s Chowder House have made a commitment to restoration and conservation of the wild salmon and steelhead populations in and around the Puget Sound, the Salish Sea, and the Pacific Northwest. Across the northwest, Long Live the Kings has been uniting partners, donors, and heroes. Duke’s Chowder House is one contributor to this 30 year legacy in which nearly 1 million fish were returned to their natural home thanks to the tremendous efforts of over 150 scientists, more than 250 partners, and 1600 donors. Duke’s Chowder House is proud to take part in this legacy and its continuation for years to come. A portion of sales from Duke’s new cookbook, "As Wild As It Gets...Duke’s Secret Sustainable Seafood Recipes," will benefit Long Live The Kings for a tireless commitment to the restoration of wild salmon in the Pacific Northwest waters. 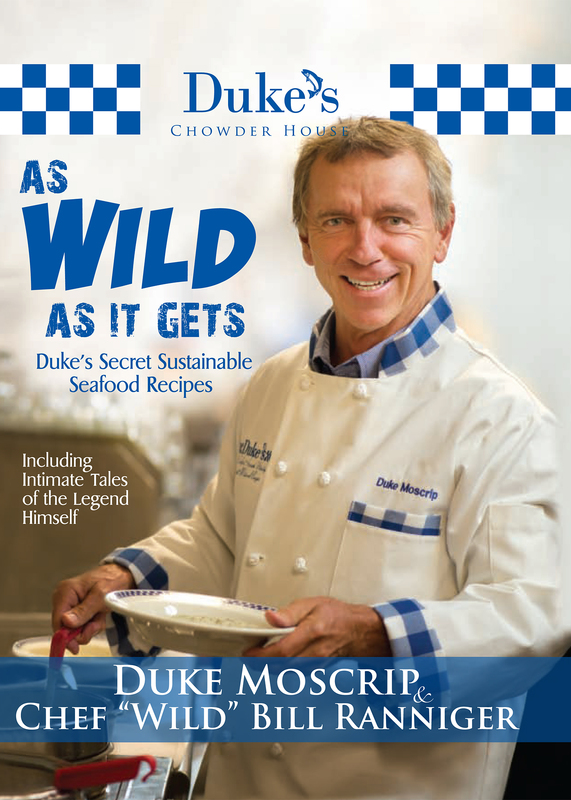 For more information on Duke’s Chowder House, visit http://www.dukeschowderhouse.com/. For media inquiries, contact Tina Carey at askbettina(AT)gmail.com. Duke’s Chowder House is a family owned and operated enterprise with six different locations throughout the Puget Sound region. Renowned for its Award Winning Clam Chowder, Duke’s menu is filled with delectable seafood dishes crafted by Duke and Duke’s very own Executive Chef “Wild” Bill Ranniger–a proclaimed culinary genius in the region. Founder and Owner Duke Moscrip – together with his son and partner John Moscrip – continue their passionate journey to source all wild, natural, healthy and fresh tasting ingredients. Duke’s food is free of hormones, antibiotics and harmful chemicals. Duke’s is an upscale, casual Pacific NW seafood concept offering signature, flavorful, 100% sustainable wild seafood, Award Winning Chowder and grass fed burgers. Guests sum up their favorable assessment of what Duke’s Chowder House has to offer with three words: “It’s sooo good!” Duke’s is honored to have received the highest seafood restaurant rating in the State of Washington by Fish2Fork, a leading evaluator of worldwide seafood restaurants, garnering a 4.5 out of 5 (no higher rating in the world). Duke's is equally honored to be among the first restaurants in Seattle to be recognized with a 100 percent volume compliance sustainable seafood rating from Smart Catch, a program designed to promote sustainability and raise consumer awareness regarding sustainable seafood options. Learn more and join Duke's VIP club at http://www.dukeschowderhouse.com/email-club/. Long Live the Kings (LLTK) is a public 501(c)(3) nonprofit organization committed to restoring wild salmon and steelhead to the waters of the Pacific Northwest. LLTK pursues projects and partnerships that compel coordinated, scientifically-credible, and transparent changes to harvest, hatchery, and habitat management to protect and restore wild salmon using innovative tools, proven processes, and a track record of success to each of our projects. With non-government partners, LLTK builds new and necessary constituencies and support for change. For more information visit http://www.lltk.org/.